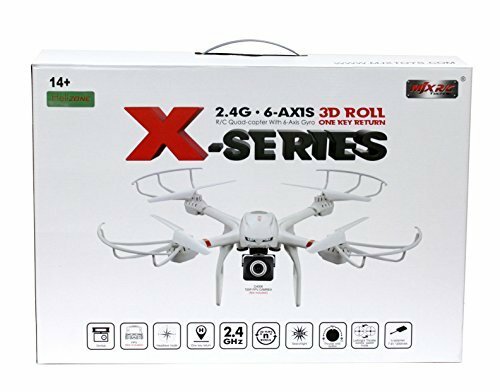 Drone comes equipped with a 720P High Definition Camera with Anti-Shock System for shock absorbance to deliver High Quality Shots and Footages. Enjoy Live First Person View by connecting Mobile device to the App. ;Headless Mode: Orientation of the Quadcopter is in relation to the pilot. The direction and orientation of the drone is dependent on the position of the user. One Key Return Home Function: With the press of a button (return to home) in Headless Mode, the drone would be able to fly back to the direction of the transmitter. ;3D Flips and Rolls: Perform flips a roll action with the drone in Pro Mode with the latest 6 Axis Gyro Flight Control System, which enhances the overall flight experience and stability during flight. Comes equipped with 4 coreless Motors. ;Transmitter Control Mode and Throttle Limit Mode: Adjust the transmitter controls for different mode of flight. Throttle Limit Mode limits the throttle inputs to the drone from the transmitter for beginner's safety. ;Virtual Reality Screen Display: View split screen through the App for a truly immersive flight experience. Headset not included. View More In Action Figures & Statues. If you have any questions about this product by Helizone, contact us by completing and submitting the form below. If you are looking for a specif part number, please include it with your message. Puredick?Replacement Hub Charging Multifunctional special design[Out door/Car charger] battery charger for DJI Phantom 2/Vision/Vision+ Aerial UAV Drone Quadcopter(Black) by Puredick?